Find hotel near Cessnock Regional Art Gal .. The Cessnock Regional Art Gallery (CRAG) is a non-profit association that showcases the talent of local artists from the Hunter Valley region. Their exhibits include local crafts and visual arts that have cultural significance. Their programs are entertaining and education with most exhibits including talks and activities for the general public, art students and professional artists. The exhibits are of contemporary as well historic themes. Bus Stop: Telecom Park Vincent St. near Edward St. on Bus No. 160, 162, 163, 164, 167. 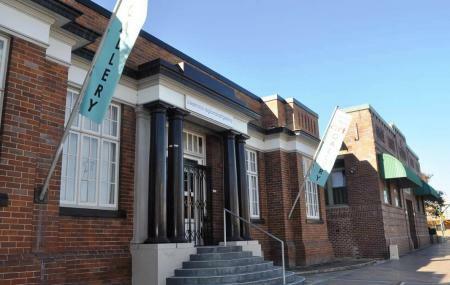 How popular is Cessnock Regional Art Gallery? People normally club together Hunter Valley Zoo and Werakata National Park while planning their visit to Cessnock Regional Art Gallery. gorgeous art space in the hunter valley. interesting and varied exhibitions, lovely dedicated volunteer staff. cute art shop full of local artists! Great little gallery well worth the visit. Very nice to visit, very friendly staff. Very disappointed. Turn up for a visit on Sunday at 2.45, advertised closure is 4, to see the retrospective, and it is closed. No signs, no reason given. Very poor form. A small Regional Art Gallery with local artists presenting interesting and varied artworks and the occasional stand out artist as in the solo exhibition seen last week by local artist Katrina Rose - worth a look.